Tourism - Gite "Les Grenouilles"
* 2 min driving : Belley Mireille Belle professional painter and sculptor, welcomes you on demand in her workshop in Belley to discover her artistic world. At the gates of the Natural Park of the Massif des Bauges, Aix-les-Bains combines sweetness of life along the water with dynamism. 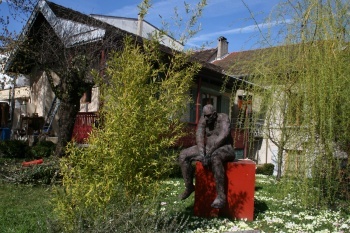 City of Art and History in the heart of the Savoie, Chambery offers to its visitors a very important “preserved area ” actively enhanced by its old streetsas well as by its protected historical buildings. 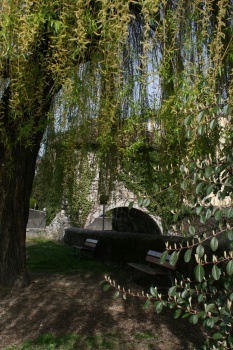 You can stroll through the old town, dominated by the Ducs de Savoie Castle. Massive figure over the upper Rhone valley and the vineyards of Bugey, the Grand Colombier (1534 m) is the most meridional of the major summits of the Jura mountains. * 10 mn driving : Yenne has two climbing areas.